Hammam towel Yellow | Luxury Peshs. hammam towels made ​​of highly absorbent cotton. Turkish Hammam towels are lightweight and ideal as bath towel or beach towel. The hammam towel (also called Fouta Towel or pestemal and sometimes spelled as 'hammam') is originally from Turkey where they are used in the hammam (bath houses) as a shawl or towel. 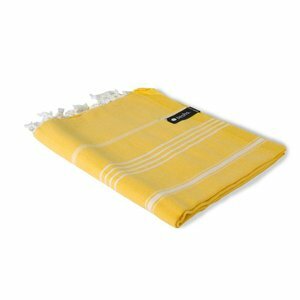 This luxurious Turkish hammam towel in the color yellow (with white stripes) of the Dutch brand Peshs. is made of highly absorbent hydrophilic cotton so these hammam towels absorb moisture very well. The lightweight fabric make them an ideal replacement for bath towel or beach towel because they can be very compact when folded. Ideal for travel, fits in any case! All Peshs. 's hammam towels are handwoven in Turkey. This means that there could be a differences in color in some cases and weaving flaws are possible. This makes any Peshs. hammam towel to a unique product!